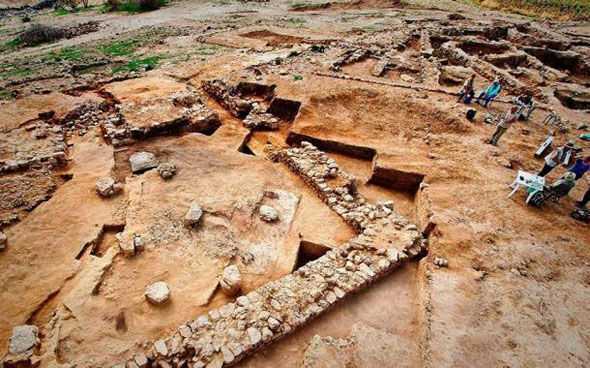 ALBUQUERQUE, N.M. – An experienced archaeologist who has spent a decade searching for the ancient ruins of Sodom is now confident that his team has located the ill-fated biblical city and evidence of its sudden destruction. Dr. Steven Collins is a distinguished professor of Archaeology at Trinity Southwest University in Albuquerque and is also dean of the school’s College of Archaeology & Biblical History. In addition to writing dozens of scholarly books and journal articles, Collins frequently visits the Middle East, where he participates in ongoing archaeological research. Collins says the Tall el-Hammam site was mostly untouched by scholars when his team began conducting research there 10 years ago. When they began digging, they found remains of elaborate city infrastructure, including gates, towers, plazas, at least one roadway, and a thick city wall. From all indications, the site was once a thriving, influential city-state with a strategic location and a powerful economy. “Based on the excavated evidence, the city’s Bronze Age heyday seems to have nevertheless come to a sudden, inexplicable end toward the end of the Middle Bronze Age—and the ancient city became a relative wasteland for 700 years, for the most part void of human habitation,” reported “Popular Archaeology” last week. In what experts describe as an “occupational hiatus,” the Tall el-Hammam site was evidently abandoned for centuries. As the researchers work to piece together the clues, Collins says his team has identified a distinct layer of ash at the site that dates back to the Middle Bronze period. The ash could be evidence of a fiery destruction, much like the one described in Genesis 19. Pottery shards that were exposed to extremely high temperature levels have been recovered from the site—another potential indication of a fiery disaster. Is Tall el-Hammam indeed Sodom? Collins is increasingly confident that it is.